Laser cut black plexiglass, crystal sphere, black plexiglass. Limited edition of 20. Wlaking in the tropical rain forest one day, in a instant I lost my aim. So I let my erratic stepd flow towards the deepness of the natural labyrinth. Wrapped in a cloud like subtle silk veil, I saw my footprints disappear; the tree leaves erased every memory. At that point I realized I was in a place equidistant from any of the forest's limits, in a virtual center of that grand enveloping vegetation. So the consciousness that all forests are, in essence, round labyrinths, came to me: they are natural structures built to get anyone entering strayed. While I was captive in a place with no walls an intoxicating sensation of fredom permeated my bones.the universe revealed itself without any conjecture, plans or principles. I flew, without wings, in ecstasy of light, with no topographical reference or time measurement, feeling every inch of my skin, letting the air kiss my lips with newly born moist, infusing life within. I started to create round forests. I drew and painted the image born from that experience. 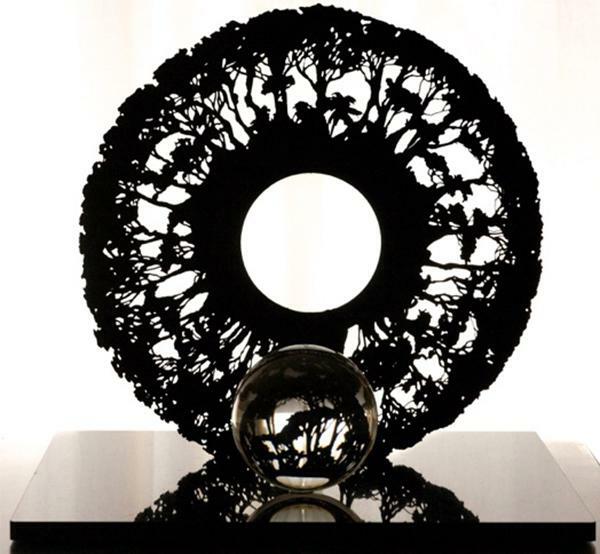 The result was the sculpture "Round Forest". After a brief incursion in architecture and a year of painting at New York University, New York, NY., Jorge Cavelier traveled to study in Florence, Italy, in the Accademia di Belle Arti di Firenze where he finished his BFA in 1982. Returning to Colombia the same year he founded “Trazo” an open studio in Bogotá; he worked and taught painting techniques there until 1987. In 2000, he traveled to the U.S. where he decided to migrate. He has exhibited in solo and group exhibitions since 1983.